Thomas Graham was born in Glasgow in 1805. His father, a textile manufacturer, was convinced that he should enter the church, but Graham resisted and in 1826 graduated from Glasgow University. This was followed by postgraduate study in Edinburgh, where he presented his first lectures in chemistry. 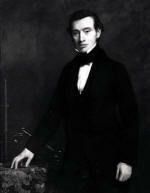 In 1828, Graham returned to Glasgow to work as an industrial consultant, before being elected to lecture in chemistry and mechanics at the Glasgow Mechanics Institution the following year. Then, in 1830, he became the one of the first professors of the Andersonian University, taking up the Chair of Chemistry. Graham's lectures were, unfortunately, not particularly enlightening as far as his students were concerned. He is reported to have been awful at teaching elementary classes - he couldn't keep discipline, and he was hopeless at explaining his subject to an audience. Where he did excel, however, was in practical laboratory work. Graham was a brilliant experimentalist, who had the ability to inspire his students to do excellent research. Graham was fascinated by the motion of atoms in gases and liquids, and spent most his time studying the diffusion of gases, and undertaking a study of the nature of phosphates. This work won him the Keith medal from the Royal Society of Edinburgh in 1833, the Royal Medal of the Royal Society in 1838, and later led to him being elected for fellowship. His work on the diffusion of gases was used in 1868 to discover the chemical formula for ozone 03. Graham's investigations of the behaviour of crystallised compounds passing through membranes, as a method of separating large molecules from similar compounds, led to the technique of dialysis. Graham's method is still in use in hospitals today, for purifying the blood of patients with kidney failure.